Posted in: ATP, Guest Writer, Miami, On Site. Tagged: 2015 ATP Miami, 2015 Miami Open, Andy Murray, atp, ATP Masters Series, ATP Miami, djokovic, Djokovic Miami, Djokovic Murray, Esam Taha, Martina Hingis, Miami Open, novak djokovic, Sania Mirza. Novak Djokovic won his fifth Miami title, and completed his third career IW/Miami spring masters sweep with a 3 set win over Andy Murray on Sunday. Djokovic continues to be the world’s best player, and he has swept all of the elite level events thus far this season, the Australian Open, Indian Wells, and Miami, as it seems that he is just about untouchable on hard courts at the moment. After a couple of weeks of non-stop tennis action down in Miami, everyone was ready for the much-anticipated final between heavyweights Novak Djokovic and Andy Murray. The pair have already clashed twice this year, as recent as in Indian Wells in a one-sided affair in favor of the world #1. Murray was looking to put in a better fight against an opponent he has not been able to figure out in recent times, losing 9 of their last 10 meetings. Meanwhile Novak was aiming to become the first player ever to win the Indian Wells – Miami combo 3 different times. Coming off a good performance vs Isner in the semifinal the Serb felt like he was peaking at the right time. Murray came to play. The crowd barely settled in their seats as the world #4 went to work early, coming out with aggression on Novak’s serve forcing him to deuce right off the bat. It would end up being a tough hold for Novak but Andy had sent a clear message, he had come to play. Murray would hold at ease and once again the Serb would find himself in trouble on his service game. Murray was taking the initiative, stepping in whenever he saw an opportunity. It would pay off as Murray would be the first to draw blood as he broke to go up 2-1 early in the first. Djokovic despite looking a tad sloppy to start would not lose focus, but rather elevate his game to break right back the very following game. Novak realized this wasn’t going to be a repeat of Indian Wells, he needed to bring his A game. At 2-3 Murray would win a couple of incredible points to engaging the crowd early on, there was a lot of positive language from the Andy. He was locked in, somehow, ripping a backhand winner off a tough return from Novak to hold and square things up at 3-3. Just when it seemed both players were kicking it into top gear Novak would make 4 UEs on the trot to gift Murray his 2nd break of the set. Murray would politely exchange gifts with Novak as he committed a few unforced of his own to give away his service game and tie things up at 4-4. It seemed like there was one side of the court affecting both players, the sun appeared to be right in their line of sight. It would be more apparent as Novak easily held while serving from the other side to go up 5-4. Murray would show little nerves to return the favor and take the set to 5-5. Despite a brilliant cross-court return winner from Andy to start the game Novak would keep his calm and hold to put the pressure back on Murray at 5-6. Murray serving with the sun in his eye would feel the pressure falling in a 0-30 hole. A splendid drop shot, a beautiful cross court backhand winner to win a long rally and Murray gets it right back to 30-30 as the crowd roared him on. As he looked set to force the tiebreak a brutal net cord would send it to deuce. Murray would survive the mini-battle as Novak left the drop shot short to force the tiebreak. Murray would not have his best tiebreak, committing a couple of bad errors to gift Novak a couple of minibreaks. Novak would get one of them back thanks to a Novak DF but he’d end the tiebreak with 3 balls straight into the net to lose the tiebreak and 1st set 6-7 (3). It was a tough way to lose the set considering Andy had slightly outplayed Novak for most of it. Murray needed to reset and put that 1st behind him, and that would be exactly what he would do to start off the 2nd as he held with ease. At 1-1 Andy would find himself in a 0-30 hole as he tried the drop shot lob combo with Novak underestimating the Serb’s speed. A sloppy overhead from Murray, which would prove to be the first of many for both players, would set up a couple of breakpoints for Novak. The Scot would battle back and save the breakpoint with an ace as he let out a big fist pump. Novak stared at his racket as he knew he let Murray off the hook with an unforced error on a return off a weak Murray 2nd serve, that was the 4th BP Murray saved that game. “COME ON!” Murray shouted and motioned to the crowd as he fired two big serves to hold and escape a dangerous game. The pendulum would quickly swing the other way as a DF from Novak set up a break point for Murray. However Andy would bail out the defending champion with a couple of UE to level things up at 2-2. The finalists would trade holds, Novak sealing his with a difficult DTL backhand winner, to which the “Nole, Nole” chants broke out in the crowd. A somewhat sloppy set would continue with more and more UEs from both players, including an awful display of overhead misses. Still there were no breaks as Novak came out to serve to stay in the set at 4-5 in the 2nd. The sloppiness would continue from the Serb quickly falling behind 0-30 with the pressure mounting. Andy 2 point away from claiming the 2nd, hit a winner off a Novak overhead, a shot he has been particularly struggling with all afternoon, to set up 3 set points. Murray would claim the 2nd in emphatic fashion as he punished a weak Novak 2nd serve with a cross court backhand winner. The frustration would visibly get to Novak as he snatched a towel from a flinching ball boy while yelling at his box, invoking a code violation warning. It wasn’t a good look for the Serb but he would later apologize for the incident on his facebook page. The crowd was excited, the 2015 Miami Open final was going the distance. Despite Murray having the mental edge given how things ended the previous set, he didn’t start off the 3rd like he had it. Murray would have not 1, not 2, but 3 chances to put away an overhead but Novak would deny him to set up break points. Andy would save one but then stick the backhand right into the net to go down a break right off the bat in the decider. He would look to make amends quickly pushing the Serb to deuce with aggressive play. Novak would have to pull off an incredible play to consolidate as he flicked a ball that was practically behind him to take the point. It seemed like Andy put all he had into that game, what would follow would not be pretty. The Scot showed plenty of negative body language and moving gingerly between points, summing it up with a double fault to face triple break point. Out of nowhere the Scot would bring himself back into it saving all 3 breakpoints including a perfectly placed DTL backhand winner, bringing the crowd out of their seats. Another Murray missed overhead, the theme of the match, would setup a 6th break chance for Novak in that game. Novak would not let 6 opportunities pass him by, converting the 6th to put one hand on the trophy as he went up 2 breaks, 3-0 in the decider. There wasn’t much fight left in Murray following that, he was broken again to give the Serb a chance to serve out the bagel. The world #1 would make no mistake as he closed out the 3rd set to claim his 5th Miami Open title 7-6(3) 4-6 6-0. It was an anticlimactic finish to a final which was dramatic yet subpar in terms of quality. 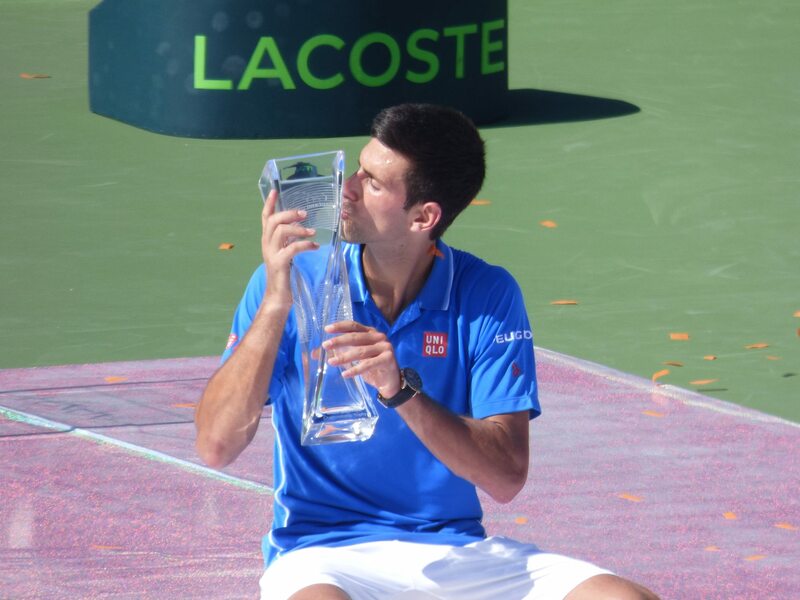 Djokovic became the first player ever to win the Indian Wells – Miami duo 3 separate times. Sania Mirza and Martina Hingis won the WTA doubles final over Makarova/Vesnina, just like Djokovic, they completed their own Indian Wells/Miami double as they swept the spring masters events. Posted in: ATP, Guest Writer, Miami, On Site, WTA. Tagged: 2015 ATP Miami, 2015 Miami Open, 2015 WTA Miami, Andy Murray, ATP Miami, Bob and Mike Bryan, Jack Sock, John Isner, Miami Open, Miami Open Presented by Itau, novak djokovic, serena williams, tomas berdych, Vasek Pospisil, WTA Miami. On Friday Novak Djokovic and Andy Murray setup their second straight head-to-head showdown for a Masters title with wins over John Isner and Tomas Berdych, while Serena took out Carla Suarez Navarro for yet another WTA title in a blowout final. Novak was not having his best tournament in terms of performance entering the semifinal clash with John Isner. There was a sense that he needed a solid showing here going into the final. 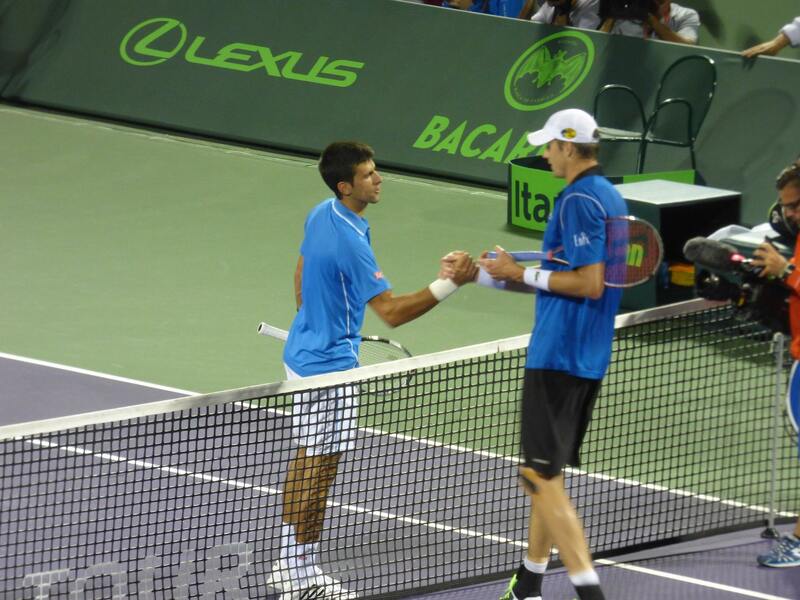 The good news for Djokovic was that he had just beaten Isner in Indian Wells a couple of weeks ago in straight sets. Having said that Isner was playing much better now and the Serb wasn’t looking as sharp. Isner so far has had an impressive run down in Miami, beating Dimitrov, Raonic, and Nishikori back to back to back. Big John has been serving absolutely lights out and was full of confidence going into his clash with the world #1. The crowd gathered for the highly anticipated night session semifinal as the two semifinalists started their pre-game warmup. Right off the bat Djokovic looked much more focused than he did all tournament with a solid service game to kick things off. It seemed like Isner would easily hold as well going up 40-0, however Novak would fight back to deuce things up. Early on Djokovic was getting his racket on most of Isner’s serve, his superior returning skills were on full display. Isner would hit a sweet volley to avoid a breakpoint and eventually blast an ace down the T to hold after the mini-battle. 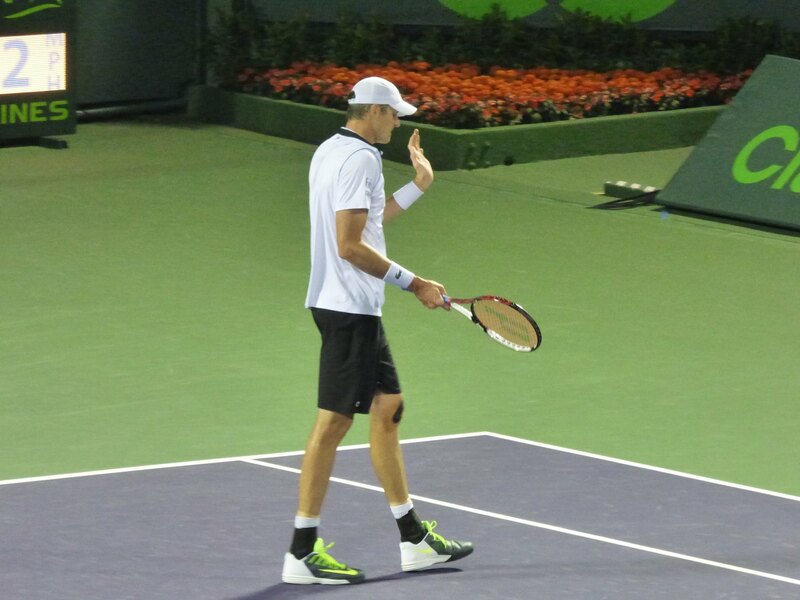 Isner’s forehand looked powerful early on, he went all out on it on virtually every shot. He’d get a nice return winner but follow that with a forehand to the bottom of the net Novak held to take us to 1-2 in the 1st. As much heat Isner packed in that forehand, once the rally got going the gap in consistency between the 2 would show itself. Novak’s defense and returning were top notch, as they need to be when playing John, on one occasion he’d force the latter to hit 3 overheads on a single point. The Serb would force deuce again on Isner’s serve but the big server would find a way out without facing breakpoint. Meanwhile the world #1 was getting little resistance from Isner on his service game, the Serb was serving pretty well himself. At 2-3 both players would really hit their stride with easy holds to take us to 3-4 in the 1st. One issue with Isner up to that point was his 1st serve percentage, which was hovering around 60%. That won’t cut it against the best returner in the game. Isner would follow a couple of bad misses with back to back aces down the T to level things at 4-4 as Novak just shook his head at the monster serves. The roles would be revered the next game. Isner would finally put some pressure on Novak’s serve following a long baseline exchange which the American somehow won coupled with an inside out return winner, much to the crowd’s delight. Novak would then give Isner a taste of his own medicine firing back to back aces to dig out of the 0-30 hole and hold. With Isner under some pressure serving at 4-5, he’d show zero nerves as he blasted a forehand winner followed by a 136 MPH heater down the T. Novak would continue his good serving to go up 6-5, the Serb had 5 aces to Isner’s 6 thus far. After Isner goes up 40-0 he would tighten up falling all the way back to face the first break point of the match. Big John would show good composure as he hit a clutch overhead followed by a 128 MPH well-placed ace to force a tiebreak. Despite the missed opportunity the world #1 was determined, immediately jumping on Isner’s 2nd serve to go up a mini-break. It was all Novak in that tiebreak, Isner probably wished he gotten more 1st serves in during that TB as Serb had a beat on the American’s kicker. With a little over an hour in the books, Novak stroked the cross court backhand winner to claim the 1st set 7-6(3). Djokovic brimmed with confidence going into the 2nd set, forcing triple breakpoint early on at 1-1. The Serb was really starting to look unplayable as he broke with ease, the American had a mountain to climb down a set and break. One big adjustment Isner had to adapt to is Novak’s superior serving compared to Nishikori in the quarterfinal matchup. The world #1 played like a world #1 that 2nd set, he consolidated with ease before forcing another double break point already up 3-1. A low biting slice would be almost impossible for Isner to get down to and slice back, the Serb was now in total control up a couple of breaks at 4-1. Novak was also out-aceing Isner 10-8, pretty much summed up how the match had gone. Djokovic would bring the crowd to their feet as he was on full stretch to retrieve an inside out forehand before passing John with ease. Novak was the definition of locked in. At 5-2 Djokovic would have no trouble serving out the match to a huge ovation from the crowd. This was exactly the sort of performance he needed going into the final given how he had played up to that point. Andy Murray continued his good run of play on his home court effectively, as he beat Tomas Berdych yet again 4 and 4. Murray broke early in the first at both 1-0, a break he couldn’t consolidate, and 1-1, and after that he cruised through the first set without facing another break point the rest of the set. Set 2 was groundhog day, as just like set 1, Murray broke for 1-0, got broken back, and then broke again for 2-1, and held his serve the rest of the way without facing another break point. In the final game of the match, he held serve from 0-30 to take it on his lone match point. Statline wise, Murray’s 70% first serve number and 80% of first serve points won were the main marker as to why he was too difficult to beat, as Berdych failed to do enough on his opponents serve to cause trouble, while Murray was a superior returner on his opponents serve. After Murray was blown out by Djokovic in Indian Wells, it’s going to be a tough task to upset him in Miami, but we’ll see what happens on Sunday. Makarova/Vesnina and Hingis/Mirza setup the WTA doubles final with routine wins in the doubles semifinals over Hlavackova/Hradecka, and Babos/Mladenovic respectively. From the time she stepped on court, Carla Suarez Navarro lacked both the belief, and the raw ability needed to beat an in-form Serena Williams, and thusly Serena entirely dominated proceedings and won in less than a hour. CSN only won 5 points in the second set and Serena has yet to lose a match this season, as the world number 1 is again dominating the WTA tour. The 33 year old Williams has won 8 WTA Miami titles and has won the title 3 times in a row at the Crandon Park Tennis Center. CSN can still be pleased with her week however as she will enter the top 10. In a burgeoning ATP doubles rivalry, the veteran Bryan brothers beat younger upstarts Jack Sock and Vasek Pospisil to win their fourth Miami title, and an incredible 105th title overall (33 Masters titles). The Bryans dominated on serve in the first set but they would lose control of the match in the second set, and were forced into a entertaining third set tiebreak to decide the winner. In their Indian Wells meeting, it was Sock and Pospisil who came out on top, but the Bryans would win this time by the slightest of margins, as experience beat youth on the day. On Sunday, along with the Djokovic-Murray match, Hingis/Mirza will seek to continue their doubles success against Makarova/Vesnina. Posted in: ATP, Miami, On Site, WTA. Tagged: 2015 ATP Miami, 2015 Miami Open, 2015 WTA Miami, atp, ATP Miami, Carla Suarez Navarro, david ferrer, John Isner, Kei Nishikori, Miami Open, Miami Open Presented by Itau, novak djokovic, serena williams, wta, WTA Miami. The two men’s quarterfinal matches on Thursday in Miami drew plenty of attention, as the world number 1 Novak Djokovic advanced, and John Isner posted his best result of the season with a huge upset over Kei Nishikori. The Miami crowd was treated to a heavyweight matchup in the Miami Open Quarterfinal night session. The world #1 had had quite the bumpy ride so far including a comeback effort against Dolgopolov in the previous round. Novak has won his last 7 meetings with Ferrer, his last loss dating back to the 2011 ATP WTF. The Serb was favorited going into this matchup but it wasn’t to expect to be a cakewalk especially with the way he’s been playing in Miami. Meanwhile David Ferrer hasn’t dropped a set so far in the tournament, knocking out Delbonis, Rosol, and Simon in the 2nd, 3rd, and 4th rounds respectively. Ferrer is having an excellent season so far only losing 2 matches and already with 3 titles under his belt, it was also his 33rd birthday today. Ferrer would kick off proceedings with a solid hold, he looked focused and ready for the challenge with the way he was stroking the ball early. Meanwhile Djokovic looked a bit sloppy to start things off, quickly falling to a 0-40 hole on his serve. A double fault later and all of the sudden the Serb would find himself down a break with Ferrer serving to take a 3-0 lead. The Serb’s returns looked uncharacteristically tame on center court, putting little pressure on David’s serve. Just like that the world #1 would find himself serving out of a 0-3 hole. Novak would start to slowly get into the game as he stroked a beautiful looking DTL backhand winner to finally get on the board. Ferrer was defending with purpose, forcing Novak to hit that one extra shot. The Serb missed a volley as Ferrer held and went up 4-1. Once again, the frustration seemed to be getting the best of the defending champion, shades of the Dolgo match. Those in the Miami crowd that enjoy long rallies and endless groundstrokes were getting their money’s worth, both players seemed content with playing from the baseline up to that point. This game became more and more crucial as it kept swinging back and forth at deuce, Ferrer looked for the double break lead while Novak looked to get even on serve. Ferrer would splendidly save a breakpoint with a slick half volley pick up to the crowd’s delight. Novak however was the slight aggressor in that game and eventually came out with break after a grueling game. He’d hold to square things up at 4-4 in the 1st. Even though Djokovic was starting to play better he was still letting frustration get to him as he let out a rather audible scream when he missed a DTL forehand. Both players would hold to take the set to 5-5, however Ferrer was starting to rack up the UEs. That would carry on to a crucial service game as he sent 3 forehands long to get broken after going up 40-15, a backbreaker for the Spaniard. Novak would easily hold to take the 1st set 7-5, it was a poor end to the set from David. Ferrer seemed to shake off that disappointing conclusion of the opening set as he came out firing with a convincing hold. Novak would follow that with a solid hold of his own, showing his soft hands with a perfectly executed half volley. Ferrer would bring the crowd to their feet the next game with an incredible display of reflexes at the net, which Novak acknowledged as well. It all went downhill from there for the Spaniard as he committed back to back double faults to get broken early in the 2nd. The Serb was now controlling court position, doing a better job of stepping up and punishing Ferrer’s conservative court positioning. At 1-3 Ferrer had to regain his composure to avoid finding himself staring at a double break deficit. After getting it to 30-30 Djokovic bailed the world #7 out with a couple of FH UEs. Both players would continue to trade holds but Ferrer wasn’t putting any pressure of Novak’s serve. At 3-5 Ferrer felt some pressure as he served to stay in the match. A brutal netcord would help Novak jump up 0-30 in the game. Ferrer battled back to 30-30 while a cheeky drop shot from Novak just missed to take the set to 5-4. Novak would have to do the dirty work himself. The world #1 showed some nerves as he double faulted to go 30-30. Ferrer then overcooks a forehand to setup a match point for Novak. The Serb would get tight once again sending the backhand to the bottom of the net. The crowd would go ballistic as an incredible rally ended with Ferrer on top to break and even things up at 5-5 after facing match-point. The Serb would bounce back quickly breaking David right back as the drama intensified. This time Novak would quickly jump to 30-0 and not look back, closing the set out to claim the match 7-5 7-5. The defending champion booked himself a spot in the semifinal to face big John Isner, who’s been on a tear beating Dimitrov, Raonic, and Nishikori back to back to back. John Isner scored his second top 10 win of the week as he took out the favorite Kei Nishikori 6-4 6-3 to reach the semis in Miami, his best result of the 2015 season. The scoreline is a bit misleading, as Isner took control of the match early on, and also broke early in the second set. Nishikori failed to challenge him as a returner, and Isner won a remarkable number of return points himself, in fact putting up one of the best return performances of his career, against a quality ballstriker in Nishikori. Nishikori had dominated all of his opponents in the previous tournament matches, but today he no answer for the brute force and excellent shot placement that Isner put together. Nishikori thought he played well per his post-match presser, but Isner put up a textbook performance for a slow moving big server. Carla Suarez Navarro pulled off a remarkable feat as she upset Andrea Petkovic 6-3 6-3 to reach her first ever Premier level final. It was a sloppy match with players putting up a large number of errors, but in the end CSN continues to improve and cement herself as a top 10 player. Serena Williams battled past Simona Halep to complete the WTA final lineup 6-2 4-6 7-5. Williams power proved too much for defensively oriented Halep, and she could have taken the match in straight sets perhaps, but was forced into a long third set. 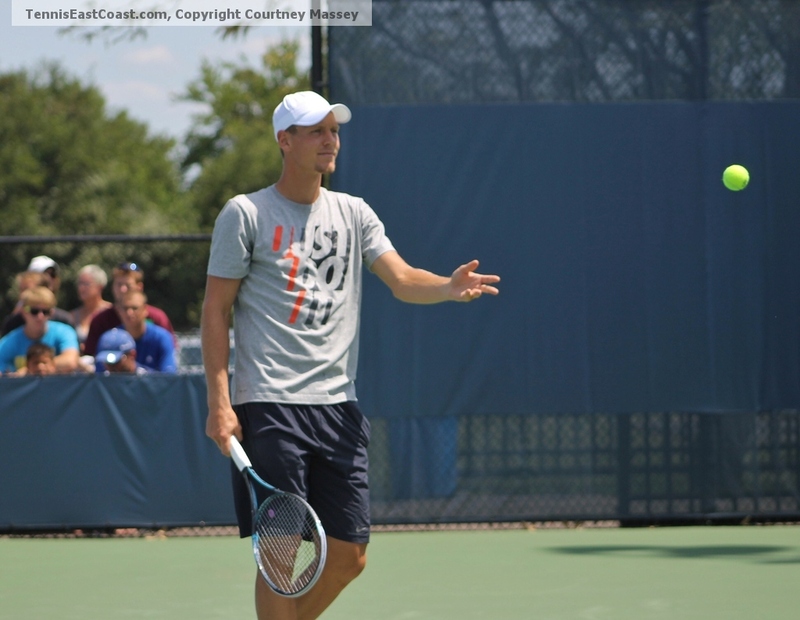 Vasek Pospisil/Jack Sock and the Bryan Brothers will face off in the ATP doubles final. Vasek and Jack beat Melo/Soares 6-4 3-6 10-7 and Bob and Mike Bryan beat Isner and Querrey 7-6 7-5. Posted in: ATP, Miami, Steen Kirby, WTA. Tagged: 2015 ATP Miami, 2015 Miami Open, 2015 Miami Open Presented by Itau, 2015 WTA Miami, Andy Murray, atp, ATP Miami, Dominic Thiem, juan monaco, Miami Open, Miami Open Presented by Itau, sabine lisicki, serena williams, Simona Halep, sloane stephens, tomas berdych, wta, WTA Miami. Serena Williams won a topsy-turvy encounter over in-form German Sabine Lisicki on Wednesday in Miami, as the wrorld number booked her place in the semifinals 7-6(4) 1-6 6-3. Serena did well win a nervy first set, and it was a good thing she survived the tiebreak, because Lisicki caught fire in the second set, bludgeoning Serena into a third set. Serena would recover from her daze and pull it out in the third however for her 700th WTA match win. A win that puts her behind just seven WTA greats on the all-time list, including Martina Navratilova, Chris Evert and Steffi Graf. Simona Halep was also a winner on the day as she beat the unseeded Sloane Stephens 6-1 7-5. Stephens pressured in the opening game but quickly fell away in the first set, and in the second she fought back from a break down to extend the set into extra innings, but Halep was the superior player and her class finally shown through to break and hold her serve 7-5. On the men’s side Dominic Thiem played a great opening set of tennis against Andy Murray, but the more experienced and higher ranked Scot would dominate the rest of the match. Thiem was firing winners and was stiff on his serve, but Murray winning over 80% of his first serve points in the match, and recovered from the disappointment of dropping the opening set to break early in the second, and though he lost that break as the match went to 3-6 4-4, he would break again to take the second set 6-4, and then he dashed the hopes of a wilted Thiem 6-1 in the third for a 3-6 6-4 6-1 victory. Tomas Berdych dealt with hot patches of play from Juan Monaco in the late match, and won 6-3 6-4. Berdych found himself bothered by a time violation in the first set and after going 4-2 up, got broken. However, Monaco failed to consolidate, and after a very long game at 3-4, Berdych broke again and served out the set to love. In set two, the situation was somewhat similar, Monaco would come up with some great shots, showcasing superior movement, but Berdych had a larger arsenal weaponry wise, and he served just well enough to get the win, scoring a late break, and again serving out the set, and this time the match, to love at 5-4. Quisner upset Rojer/Tecau 6-3 6-4, as John Isner has had a fantastic week in Miami, and the Bryans dealt with Anderson/Chardy 6-4 4-6 10-6. In WTA doubles, Hlavackova/Hradecka beat Niculescu/Panova 6-3 7-5, and Makarova/Vesnina sent Garcia/Srebotnik packing 6-4 3-6 10-4. On Thursday, the Miami Open will have a very similar schedule of matches as Wednesday, as the two men’s quarterfinals remaining are Nishikori-Isner and Djokovic-Ferrer, and the WTA semifinals will be Suarez-Navarro vs. Petkovic and Williams vs. Halep. Melo/Soares will play Pospisil/Sock in an exciting doubles match, and the Bryans will have an all-American battle with Quisner. Keep checking Tennis Atlantic for all the exciting updates from Miami, all the way until the final match is completed! Posted in: ATP, Guest Writer, Miami, On Site, WTA. Tagged: 2015 ATP Miami, 2015 Miami Open, Alex Dolgopolov, Andy Murray, atp, ATP Miami, Carla Suarez Navarro, Dominic Thiem, John Isner, Miami, Miami Open, Miami Open 2015, Miami Open Presented by Itau, novak djokovic, wta, WTA Miami. were upset, and Dominic Thiem reached his first ever Masters level quarterfinal. The world #1 has not exactly had a smooth ride to get to the 4th round in Miami, dropping a set to Martin Klizan and having to fend off a Steve Darcis comeback effort. It wouldn’t get smoother for the Serb today as he faced an opponent that has taken a set from him 3 out of their last 4 meetings. That opponent, the Ukranian Alexander Dolgopolov is coming off 2 tight wins against veteran Tommy Robredo and a Miami crowd favorite Thomaz Bellucci. Alex has put up good fights against the world #1 in the past and today would be no different. Dolgo came out absolutely firing on all cylinders to start off the 1st set. The talented shotmaker was taking the ball on the rise and taking time away from Djokovic in the rallies, clearly frustrating him. Meanwhile Novak was out of sorts, being impatient, and easily frustrated out on center court.Alex took an early 4-1 lead in the 1st, which included Djokovic smashing his racket to the chorus of boos from the Miami crowd. The Serb would also be cited for a couple of code violations which cost him a point penalty. However despite the mental battle the Serb was fighting he would come back to even things up at 5-5 and eventually force a tiebreak. It seemed that Novak had righted the ship and was on his way to assume control, however the Ukrainian had something to say about it. The tiebreak began with a little help from the netcord for Alex to get the minibreak right off the bat, needless to say Novak was fuming. He’d let that get to his head as he quickly fell to a 0-4 hole in the TB. Dolgo wouldn’t look back as he kept his calm to take the TB 7-3 and yet again for the 4th time in 5 meetings take a set from the Serb. The 2nd set began with Alex holding with ease, Novak still looked completely dejected on the court. It would carry on to his service game as Dolgo riped an inside out forehand to set up triple break point. On the 3rd attempt the Ukranian would smoke a DTL backhand return winner to go up 2-0 and really put Novak on the ropes. Despite Novak not playing his best, Dolgo had a lot to do with it as he played lights out tennis, he brimmed with confidence. The Ukrainian is known to have the tendency to display top 10 and below top 100 level simultaneously in the same match. Top 10 Dolgo was on full force so far as he went up 3-0 in the 2nd. The next game would prove to be a pivotal point of the match. Dolgo continued to simply out-groudstroke Novak to set up a double breakpoint, an opportunity to go up a double break and tighten his grip on the match. However after a marathon of a rally Novak would come out on top to save the 2nd breakpoint, followed by a couple of UEs from Alex to hold and avoid going down 0-4. The Miami crowd could feel a hint of the tide turning. Alex would stumble the next game falling 0-30 but eventually regain his composure and hold to maintain the single break lead at 4-1. That tough hold seemed to get Novak’s mind back into the match as he produced sharper groundstrokes pinning Dolgo deep. Preventing Dolgo from getting superior court position would work as Novak finally broke to even things up at 4-4. Dolgo would elevate his level once more with some incredible shotmaking, he’d rip multiple winners on both sides of the court to hold, not easy to do against Djokovic especially on these courts. At 4-5 Nole would show his composure as he successfully held to stay in the match. Dolgo would then play a horrible service game to get broken followed by a Novak hold to take the 2nd. It seemed like Dolgo might’ve gotten hurt, the trainer would come out to tape his feet. 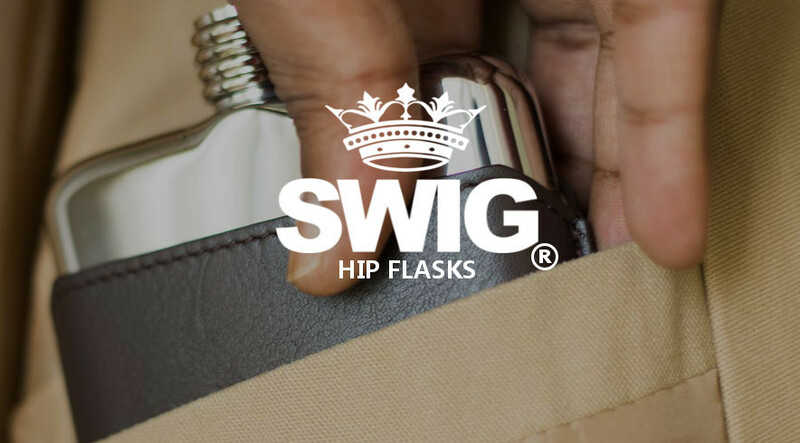 It was unclear what sort of injury it was exactly but it seemed to be affecting his ankle. It would sadly prove to be the virtual end to the match as the Ukranian won only 3 points out of the next 27, practically immobile out there, losing the deciding set 0-6. Djokovic had successfully escaped another dicey match 6-7 (3), 7-5, 6-0. Andy Murray scored his 500th career ATP Main Draw win with a 6-4 3-6 6-3 result over Kevin Anderson, Murray continued his solid season thus far, as he put up a positive winner/unforced error ratio and returned incredibly well in the third set when it counted against the big serving South African. Kei Nishikori was better in every department compared to David Goffin as that match was a 6-1 6-2 blowout. The Japanese #1 has not been challenged all tournament. John Isner upset Milos Raonic 6-7(3) 7-6(6) 7-6(5) in as many tiebreaks as were to be expected, both players served well and Isner continued the trend of being clutch when it matters, as he won the final two tiebreaks to win the match from a set down. Fernando Verdasco posted 34 errors, and wasted a break lead in the second set to fall to Juan Monaco 6-3 6-3. Young gun Dominic Thiem posted his best result of the season, and his best ever masters result with a 7-6 4-6 7-5 win in a nailbiter over Adrian Mannarino. Thiem was down a break in the third and came back against a solid Mannarino. His backhand proving to be an effective weapon. 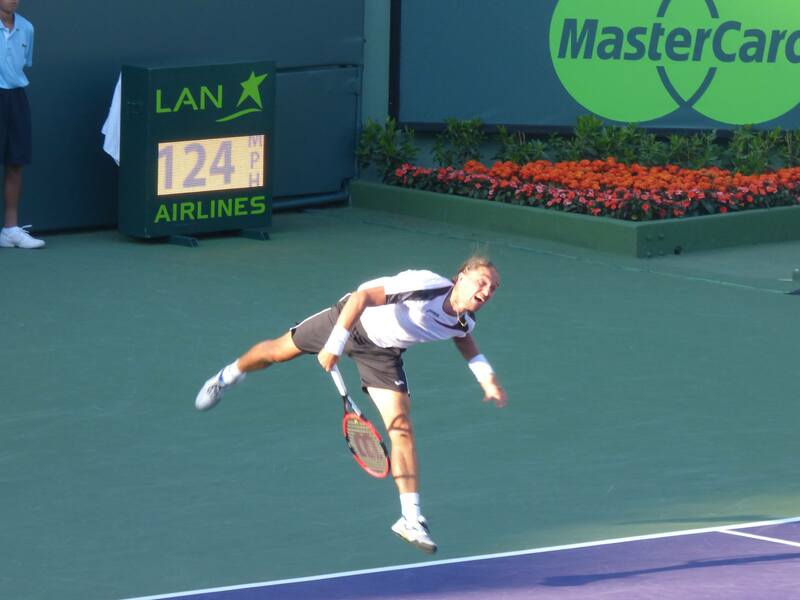 Tomas Berdych won over Gael Monfils fell and injured himself 6-3 3-2 ret. and David Ferrer beat a listless Gilles Simon 7-6 6-0. Andrea Petkovic dominated Karolina Pliskova 6-4 6-2 and Carla Suarez Navarro upset Venus Williasm 0-6 6-1 7-5 in a remarkable comeback after a bagel, as they both reached the semifinals. Babos/Mladenovic, Hingis/Mirza and Niculescu/Panova won in doubles, as did Pospisil/Sock, and Melo/Soares. Posted in: ATP, Guest Writer, Miami, On Site, WTA. 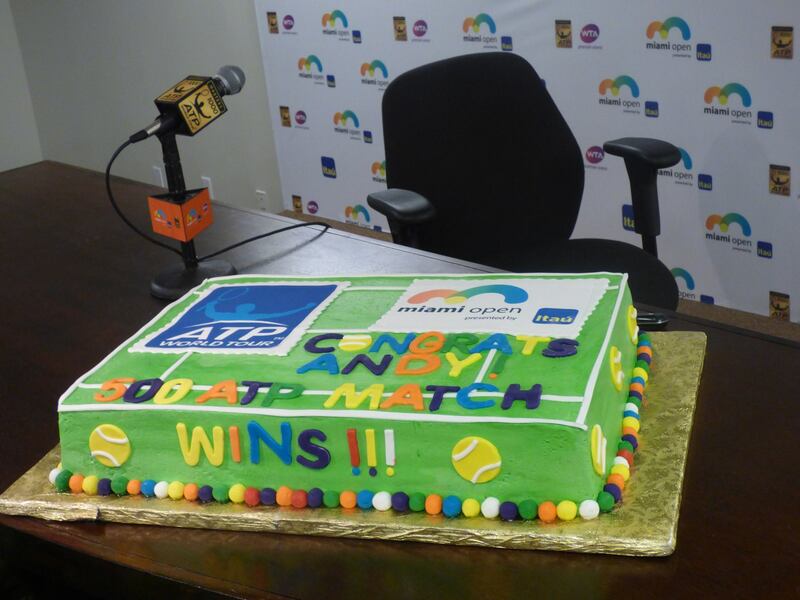 Tagged: 2015 ATP Miami, 2015 Miami Open, 2015 Miami Open Presented by Itau, 2015 WTA Miami, Alex Dolgopolov, ATP Miami, david ferrer, david goffin, Gilles Simon, Grigor Dimitrov, Jeremy Chardy, John Isner, Kei Nishikori, Miami Open, Miami Open Presented by Itau, Miami Tennis, milos raonic, novak djokovic, Pospisil Sock, serena williams, Steve Darcis, venus williams, WTA Miami. The favorites on both the ATP and WTA side held true to form on Monday in Miami, with the lone upset being American John Isner’s victory over Grigor Dimitrov. The big serving American had never faced Grigor Dimitrov before tonight, a night that would prove to be a big one for him. Isner was coming off a routine win over Andrey Rublev in the 2nd round and looking to secure a victory over the world #11. Meanwhile the Bulgarian had convincingly dismantled Vasek Pospisil a couple of days ago and looking to make amends for his early exit in Indian Wells. Isner came out on fire blasting his first serves in at a high rate, not providing Grigor with any chance to get a beat on his serves. Both players would hold serve to kick things off, but a moment of controversy would present itself quickly on Isner’s serve. Dimitrov returned a ball that was going long but Isner gave up on the ball before the out call and therefore Bernandes would call it against John bringing up double break point. John was not happy and made that very clear to Carlos. Later John would give a more thorough explanation of what happened on that play in his post-match press conference, which can be found below. Meanwhile he’d quickly forget about the incident and win the next 4 points to hold serve. Dimitrov was keeping up with Isner but he was clearly not playing his best tennis out there, and with the crowd behind the American, Grigor was truly on the ropes. Dimitrov was able to force a tiebreak nonetheless, but it would be a one-sided affair as Isner easily take it to close the set 7-6(2). Dimitrov would have to change something quickly if he were to turn thing around, the Bulgarian was very rusty while John had hit his groove. At 1-1, Grigor would find himself in a 0-30 hole in a pivotal game. He was not able to bounce back, a couple of bad misses proved costly as John got the early break to take a 2-1 lead. Isner consolidated with ease, Grigor’s returns weren’t even close to landing on the court. The world #11 would then show a glimpse of why many picked him to win tonight. He would smoke a couple of aces coupled with an exquisite forehand drop to hold. However, that glimpse would be short-lived as John would find himself with another break opportunity at 2-4, a virtual match point for the American. Grigor would tighten up and proceed to gift the break to John with a double fault, summing up his disappointing performance tonight. Isner would do his part and serve out the match out to put 1 under the W column in their only head to head meeting. Isner has been markedly improved in his last two events, while Dimitrov continues to struggle this season. The world #1 was coming off a tricky match against Martin Klizan in the 2nd round and looked to put in a more convincing performance against qualifier Steve Darcis in this 3rd round encounter. Darcis, clearly the underdog here, was coming off a comeback effort against Malek Jaziri in the 1st round and a tough grinder against Gilles Muller in the 2nd. Steve wasn’t used to the spotlight of playing in the main stadium and it showed right away, as he normally plies his trade on the challenger tour. Djokovic would proceed to steamroll past the Belgian in the 1st set with a bagel to show for it. Darcis made the mistake of trying to match Djokovic in rallies and taking him head on when he’s clearly the less talented player. Darcis however would change that approach a bit in the 2nd set. Novak held to kick things off registering his 7th straight game. Darcis would finally hold and get on the board prompting a loud cheer from the crowd. The next game brought back memories of the Klizan match as Novak would sloppily fall to deuce on his serve, but eventually hold. Steve was now engaged, keeping up as he held to tie it up at 2-2. Darcis switched his tactics in the 2nd going almost exclusively with the slice on his backhand side and it was starting to bother the Serb. The frustration would grow as Novak started making silly errors and not handling Steve’s slice very well. The Belgian would take things to 4-4, but he was hardly putting any sort of pressure on Novak’s serve, his returns were abysmal up to that point. That would change the next game. The excessive slicing would eventually get to Novak’s head as he commited back to back uncharacteristic errors, earning Steve his first break of the match. Darcis now would get a chance to test his nerves as he walked out there to serve out a set against the #1 player in the world, no big deal. Djokovic however wasn’t too happy with himself and decided to take it out on Steve as he ripped a DTL backhand winner to seal the love break. That was as close as Steve would come to threatening the Serb. The Belgian attempted to serve to stay in the match, and would make quite a fight out of it. The ending was inevitable though as he poorly attempted a drop shot that dropped well short, putting the match to rest. Again Djokovic let up a bit after bageling his opponent, but this time, there would not be a third set. After the match in press, Novak added his two cents on the rule changes to Davis Cup in regards to adding a fifth set tiebreak. Meanwhile, Darcis admitted he tried his best on the day. The two other big names in action on the men’s side of the draw scored wins today, Milos Raonic was 6-1 5-3 up against Jeremy Chardy, as he got off to a strong start, and the Frenchman was poor, even on his own serve, much less dealing with the Manitoba missile. However, Raonic slipped up and ended up having to put up a heck of a fight to advance. Chardy broke back for 5-5 in set 2, then saved break points to hold, and in the next game, break the Canadian #1 to force a third set, to the shock of everyone on the grandstand. In that third, Raonic was under pressure in multiple service games, as he was forced to save break points at 3-4. Raonic would get it into a tiebreak by the skin of his teeth, but got an edge late in that tiebreak, and scraped his way 6-1 5-7 7-6 into the round of 16. Kei Nishikori blitzkrieged through his second consecutive match, this time it was a 6-2 6-2 drubbing of Viktor Troicki as the Serbian #2 was hopeless from the start. 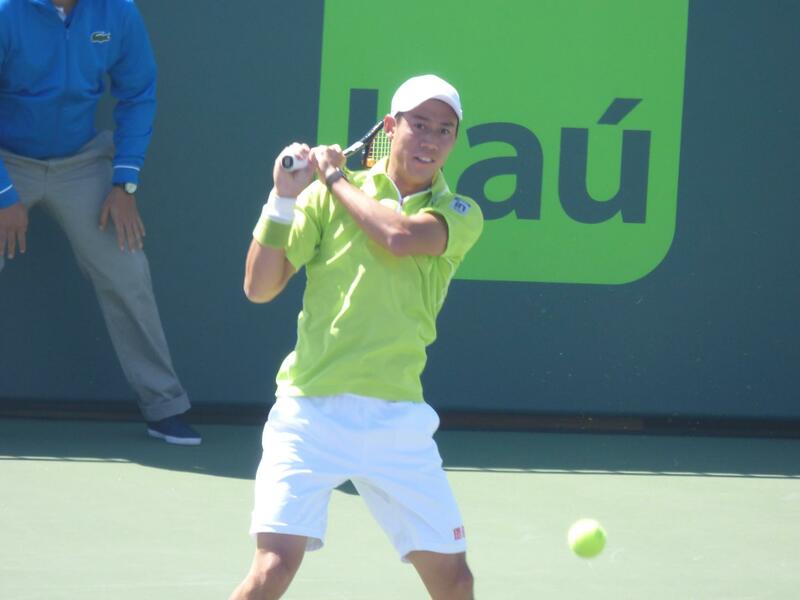 Nishikori did not play well in Indian Wells, but he has really upped his game in Miami and looks capable of challenging the remaining names in the draw. David Ferrer won 6-4 7-5 over Lukas Rosol, it was a bad matchup for the Czech, as Ferru was consistent from the ground and eventually lulled him into too many errors. Rosol put up a good fight and made it a match in set 2, but Ferrer broke in the final game of the match, on his fifth match point chance. It should be noted that Rosol had six break point chances in the first set, and failed to convert, as he simply let too much on the table against Ferrer. Alex Dolgopolov, normally a fan favorite, dealt with a hostile crowd to send off Thomaz Bellucci 7-5 6-4. Dolgopolov went on a hot streak from late in the first set, to early in the second, and was a set and a break up. Bellucci would attempt a comeback, as he had done in previous two wins (over Hewitt and Cuevas), rather than simply giving up, but it was not to be, as Dolgo simply moved too well and was too defensively sound for the Brazilian’s ball bashing to bother him. David Goffin was more consistent than Jerzy Janowicz on the day winning 6-4 6-3, Goffin didn’t serve as good as he could have, but Janowicz couldn’t stick with him on the ground. Gilles Simon won an errorfest with Alejandro Falla 6-3 6-4, there were no winners after more than a dozen points into the match, and that type of stateline should demonstrate the type of match it was, as both players felt each other out, and Simon was able to bait his opponent into more errors. Venus and Serena Williams booked their place in the quarterfinals of the Miami Open on Monday with solid wins. Venus impressive beat Dane Caroline Wozniacki 6-3 7-6, while Serena beat the veteran Svetlana Kuznetsova 6-2 6-3. Sabine Lisicki won her seventh match in nine tries, all at premier level as she drubbed Sara Errani 6-1 6-2. Lisicki will now have to deal with the machine that is Serena. Simona Halep (6-3 7-5 over Flavia Pennetta), Andrea Petkovic (6-1 7-5 over Ekaterina Makarova), Carla Suarez Navarro (5-7 6-0 6-4 over Aga Radwanska in an impressive hard court win), Karolina Pliskova (6-3 6-2 over the promising Daria Gavrilova), and Sloane Stephens (6-4 7-6 over Belinda Bencic) round out the WTA quarterfinalists in Miami. After a win over them in the Indian Wells doubles final, Pospisil/Sock again beat Bolelli/Fognini, this time in a 6-2 6-3 blowout win. Joining them as ATP doubles quarterfinalists are Rojer/Tecau who beat Cabal/Farah 6-7 6-3 10-2 in a huge comeback win, Draganja/Kontinen who beat Bellucci/Souza 6-3 6-3 , Anderson/Chardy who dominated Almagro/Garcia-Lopez 6-1 6-2, and Melo/Soares, who kept Brazilian fans hopes alive with a 7-5 4-6 10-7 victory over Jamie Murray/Peers. As for the WTA doubles quarterfinalists, one spot remains to be filled but so far it’s Garcia/Srebotnik who beat Chan/Jankovic 6-1 6-3, Hradecka/Hlavackova who beat Jans-Ignacik/Klepac 6-4 6-4, and the Rodionova sisters who beat Muguraza/Suarez-Navarro 7-5 6-1. The action will focus on the men Tuesday in Miami, as just two WTA singles matches are on the docket. John Isner and Milos Raonic will clash in a match that is likely to see at least one tiebreak, both have looked good at points this tournament, but with Isner perhaps looking better, he will have a punchers chance against the Canadian number #1, who has outshone him in recent months with better results. A clash of styles will be evident between Gael Monfils and Tomas Berdych in their round of 16 meeting, Monfils is of course incredibly athletic and fleet footed, while Berdych can bludgeon the ball and has a good offensive attack. Adrian Mannarino and Dominic Thiem will meet for the first time, as it’s a great chance for both of these underdog winners to grab Masters quarterfinal level points. Novak Djokovic will have to deal with creative shotmaker Alex Dolgopolov, who has been playing great this week, that match will be the toughest Novak has faced so far but he’s still the heavy favorite. Juan Monaco and Fernando Verdasco should delight fans, as it’s a great chance at quarterfinal points for either, Verdasco riding the momentum of a huge win over Rafael Nadal in the previous round. That matchup should feature long rallies, as will the one between grinders David Ferrer and Gilles Simon. Kei Nishikori will take on the similarly undersized but technically sound David Goffin, who is a huge underdog, and Andy Murray will have to return well against big server Kevin Anderson if he is to avoid the upset. Pospisil/Sock, and Martina Hingis will be back in doubles action on Tuesday, and the WTA matches are Petkovic/Pliskova and Venus Williams/Suarez Navarro, so be on the lookout for those matchups. Posted in: ATP, Guest Writer, Miami, On Site. Tagged: 2015 ATP Miami, 2015 Miami Open, Andy Murray, ATP Miami, david ferrer, fernando verdasco, Ferrer Miami, gael monfils, Miami Open, Miami Open Interview, Miami Open Presented by Itau, Miami Open Press conference, Monfils Tsonga, Nadal Verdasco, rafael nadal. I had the pleasure of doing a wide variety of press and interviews in Miami on Sunday, and below you can check out my press conferences/mixed zone interviews with Fernando Verdasco, Gael Monfils, Rafael Nadal, Andy Murray, and David Ferrer. Enjoy!